Not too far (50 miles) from the castle location in the previous post lies the tallest sand dunes in North America. 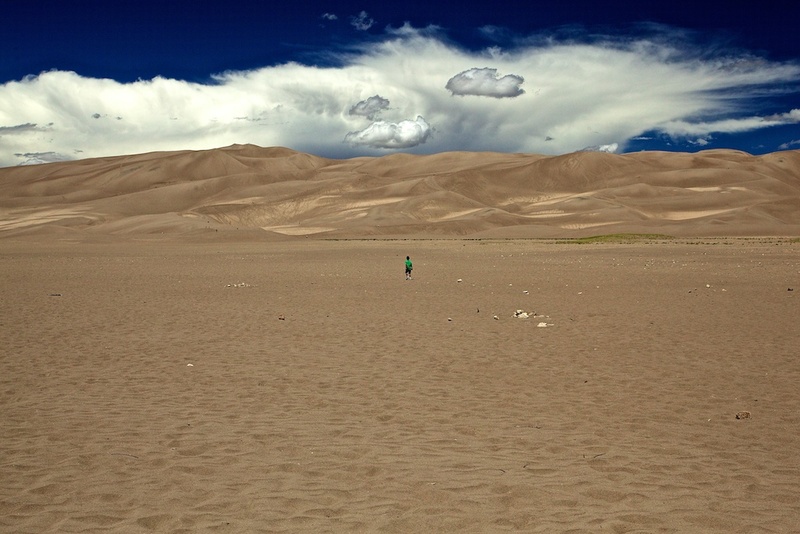 Designated as the Great Sand Dunes National Park, it has formed over millions of years thanks to an unusual combination of topography, erosion, winds and weather. It just looks like some giant trucks have dropped massive piles of sand in an alpine valley. The sand grains are very fine and have been carried to this location by prevailing winds over millions of years. This is not something you would expect to find in the middle of the Rocky Mountains. There have been some “Sahara” like movies made here. There were numerous hikers on the dunes, some along the top ridge, but are just too small to make out in my images. My grandson, below, was going to join them…I had to do some wild arm-waving to get him back! Spectacular images. The colors are magnificent. Great clouds. The lines and layers are just fascinating. I really have a sense from looking at your photographs of how wonderful it must have felt to be walking out there. Grand expanses and panoramas, wonderful clouds. The definition in the edges of the three clouds in front of the cloud bank in the second photo is spectacular. Thanks again for taking us with you, Frank.